Doctors are being asked to change their behavior toward their obese patients through guidelines developed by a group of medical organizations that include the American Heart Association, the American College of Cardiology and the Obesity Society.This is according to an AP article “Doctors are told to get serious about obesity” written by Mike Stobbe. The doctors, in turn, are being encouraged to get their obese patients to change their behavior. “We recognize that telling patients to lose weight is not enough,” said Dr. Donna Ryan, co-chair of the guidelines committee. We agree emphatically. Of course the sixty four thousand dollar question is how to get either of these groups to follow through. If you’ve followed us here at emotivestorytelling.com it will come as no surprise that we don’t believe that guidelines, no matter how well intended, will accomplish the task of behavior change. 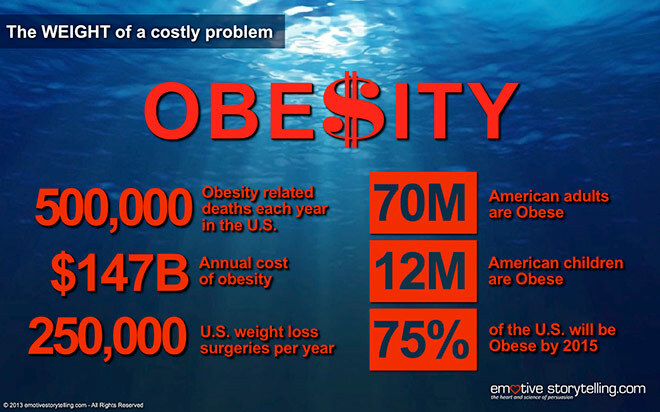 “We estimate the cost of obesity at about 147 billon dollars per year which is attributed to medical expenses, complications from health and lifestyle choices, and loss time from work,” says Dr. Marc Neff, a bariatric surgeon who runs the Eat 2 Beat Obesity program at Kennedy University Hospital in New Jersey. Doctors are being asked to calculate their patients BMI, and tell them if they are overweight. 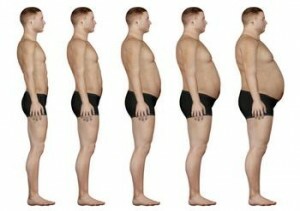 The new guidelines also tell doctors to develop a weight loss plan for their patients, to recommend weight-loss surgery depending on BMI, and to refer overweight patients to counseling. As busy as doctors are these days, they are going to need an easy button available to them if they are going to follow these guidelines. Here are some suggestions for creating that easy button. First, create an emotive story for doctors that creates some optimism that doing these things will be helpful to their patients and that the interventions suggested by the guidelines will be easy for them to implement. Second, create emotive stories as tools for doctors to provide to their patients which will move patients to seriously consider behavior change including counseling, surgery when appropriate and a weight loss plan that the patients believe will work. These narrative interventions could be developed so that doctors would have to do no more than to introduce the subject, show these to patients on their mobile devices or providing a link to these emotive stories. The patients could then be followed up by nursing staff. “We need to bring this problem to life. Sharing stories can be a powerful way to help equip surgeons and the medical profession overall to address this challenge. There is no question we need help engaging people in their own health and Emotive Storytelling is a compelling way to accomplish it,” says Dr. Neff. We stand ready to create these tools. Guidelines are fine, but emotive stories are the way to get the behavior change needed by doctors and patients alike.